GoMulti-Pakjpeglf Tees have been proven in the Performance Tee category. Available at retailers nationwide, the tee has claimed multiple victories on the Champions and LPGA Tours. Including Gil Morgan’s victory at the Wal-Mart First Tee Open at Pebble Beach. As golfers discover the distance it adds to drives, it will be an essential in every golfer’s bag. 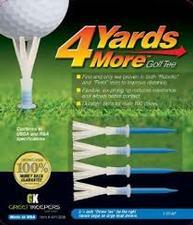 If you have any more questions about the GreenKeepers 4 Yards More (Blue) Driver 3 1/4 Golf Tees ; do not see the model you are looking for; need custom options; or prefer to not purchase online, then please call us at (630) 656-1291.